Three American Airlines passenger jets will be fitted with anti-missile systems this spring to test how the devices affect fuel consumption and how much maintenance they require. WASHINGTON — Tens of thousands of airline passengers will soon be flying on jets outfitted with anti-missile systems as part of a new government test aimed at thwarting terrorists armed with shoulder-fired projectiles. Three American Airlines Boeing 767-200s that fly daily round-trip routes between New York and California will receive the anti-missile laser jammers this spring, according to the Department of Homeland Security, which is spending $29 million on the tests. Jets will fly with the jammer device mounted on the belly of the plane, between the wheels. The device works with sensors, also mounted on the plane, that detect a heat-seeking missile and shoot a laser at it to send the missile veering harmlessly off course. This is an extremely thought provoking article I found while searching the iternet. I thought you would find this interesting. Boeing Fitting Aircraft With Illegal Parts? Are Boeing fitting their aircraft with illegal devices that could enable terrorists to remotely hijack airliners and crash them into high profile targets? In light of what happened on 9/11, Boeing's blanket denial that this practice has taken place is both highly suspicious and a threat to national security. We talked to airline industry representatives to ask them if such technology had been installed in commercial airliners and they denied all knowledge, despite the fact that Boeing were hit with a record fine of $15 million after the company broke the law by selling commercial planes equipped with the QRS-11 gyrochip, which is also used in the guidance system of the Maverick missile. According to the Associated Press, from 2000 to 2003 Boeing shipped 94 airliners oversees, mainly to China, that contained the chip, a device used for "military applications," stated the report. According to the Seattle Times, "The QRS-11 chip, made by a unit of BEI Technologies in Concord, Calif., is just over 1-½ inches in diameter and weighs about 2 ounces. It sells for between $1,000 and $2,000. Described as "a gyro on a chip," it is used to help control the flight of missiles and aircraft." "There could be dozens, even hundreds more components like the QRS11 gyros that have slipped under the eyes of State Department enforcers, said Joel Johnson, the vice president international of the Aerospace Industries Association," reports the Center for Strategic and International Studies (CSIS), and "Aircraft incorporating the QRS11 chips are already routinely making flights." Should it concern us that Boeing began installation of a chip that turns a plane into a remotely guided missile immediately before 9/11? One month before 9/11, German newspaper Der Spiegel reported that U.S. military-industrial complex giant Raytheon landed a 727 jet six times by remote control using GPS technology at a Hollomon AFB in New Mexico. In April 2001, aviation history was made when a Global Hawk, which is equivalent in wingspan to a Boeing 737, flew by remote control out of Edwards Air Force Base, across the Pacific Ocean, and landed safely at the Royal Australian Air Force base at Edinburgh, in South Australia state. Other sources from within the airline industry have told us that such devices were common in aircraft years before 9/11, a remarkable supposition that has led many to suspect that the attacks on the Pentagon and the World Trade Center were executed using this remote access system. Recent newspaper reports discussing these devices and the policy to have them in all airliners within three years assure us that they would prevent another 9/11 style outrage - but because any such system is vulnerable to hacking allied with the fact that pilots have no way of overriding the autopilot, not even with secure access codes, this only increases the chances of another 9/11 style attack. A comprehensive investigation on behalf of those who have the authority and resources to perform it needs to be mandated immediately into whether devices that completely remove control of a plane from the pilot and that have illegally been installed in many existing aircraft are a fundamental danger to national security. A new generation of tiny, cheap jets could bring commuter air travel to the masses–if the planes can ever get off the ground. Vern Raburn, the controversial C.E.O. of Eclipse Aviation, wants to lead the way, if he can overcome a three-year production delay and financing shortfalls. In the spring of 1997, Vern Raburn, a technology executive and recreational pilot, took Microsoft co-founder Paul Allen to a dusty landing strip in the Mojave Desert. Raburn had been an early Microsoft employee, and he was now working for ­Allen, helping the billionaire invest his fortune. The pair had flown in on Allen’s Boeing 757 from Seattle to meet storied aircraft designer Burt Rutan. He was working on concepts that had commercial potential, and Raburn wanted his boss to have a look. Seated in a conference room overlooking the runway, Rutan presented his designs to the two visitors, including his latest idea: a civilian rocket he believed would herald the age of space tourism. Rutan would need an angel investor, and Allen, an amateur space geek himself, liked what he saw. After the presentation, Rutan brought the two men to a nearby hangar, where he was assembling another prototype, something called the V-Jet II—a four-seat jet created by Williams International that was smaller than a Ford Explorer and capable of flying faster than 300 miles per hour. The V-Jet was powered by a pair of new engines—the tiny motors weighed just 85 pounds each, yet they could produce more than 700 pounds of thrust. Rutan told his visitors that swarms of these affordable mini-jets could be used for personal travel and as air taxis, shuttling fliers to little-used municipal airports. Raburn was hooked instantly. “I got really excited,” he recently recalled. “I tried to sell Paul on the idea.” But Allen balked. The personal computer, yes; a personal jet, what’s the point? Allen, who owned two Boeings and a Gulfstream, thought private planes were a luxury for billionaires, not the masses. After all, Warren Buffett called his jet the Indefensible. Allen invested $20 million in Rutan’s rocket several years later, but spent not a penny on the mini-jet. A few months after meeting with Rutan, Raburn decided that if no one else would finance and build the V-Jet, he’d do it himself. It’s June 2007. Raburn and I bounce 16,000 feet above the broad mesas of the New Mexican desert in the successor to the V-Jet, which he has christened the Eclipse 500. He fiddles with the autopilot as blasts of summer air shake the cabin. The auto­pilot refuses to engage, which forces Raburn to take control. “This sucker is so easy to fly,” he says, guiding the Eclipse into a wide arc. Below, the modest Albuquerque skyline slides past. Despite the growing production of regional airliners, with China as a favored site, skeptics remain doubtful about long-term prospects for manufacturing in China, citing past experiences. Airlines worldwide, surviving on slim margins, will find cheaper prices of quality regional aircraft hard to resist. Consequently more and more aircraft parts and even larger aircraft will be built in China over the coming decade, dramatically reshaping aerospace. Still, doubters cite the need for improved quality control and say that the manufacture of entire aircraft and sophisticated assemblies for foreign companies, especially if they seek US and international certification, is still in the future. McDonnell Douglas's troubled assembly programs in the 1980s and 1990s left a lingering, bitter taste.For many it remains proof that anything beyond making small parts in China will deliver losses. Yet McDonnell, seduced by the China dream like many in the past and many to come, was probably pushing China to run before it could walk. Nevertheless, foreign manufacturers have continually expanded, quietly, building a wider range of more complex parts in China. 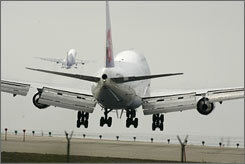 Boeing has sourced parts worth US$500 million from China between 1980 and 2004, forecast to hit $1.3 billion by 2010. Cheap labor and big sales prospects - the China dream - outweigh the troubles. In late 2002, two decades after McDonnell's program started, arch rivals Canada's and Brazil's Bombardier and Embraer announced they would begin manufacturing their small regional jets in China. Meanwhile, with 41 orders in hand, China is forging ahead with its 75-to-105-seater ARJ21. Embraer seeks to send more work China's way. "The company is currently evaluating possibilities for sourcing certain parts from its Chinese partner Hafei Aviation Industry Co Ltd [HAFEI], in substitution of some imports," says Guan Dongyuan, Embraer China's managing director. "At this moment we strongly believe that our focus should be to consolidate the industrial operations of Harbin Embraer and to satisfy the Chinese domestic market. Nevertheless, future exports are a possibility." Exports of Chinese-made ARJ21s, Bombardiers and Embraers will surely come as China's cheaper labor eventually delivers lower prices, turning heads at airlines overseas. "The first batch will likely be used in China. But it will probably be another two or three years before the quality stamp is up to international export standards," says Ravindran Devagunam, leader of the consultancy Deloitte Deloitte & Touche LLP's aviation and transport practice in Singapore. "I think price will definitely win out. I don't think airlines can afford not to" [pay attention to China's lower production prices]. China sees aerospace as strategic industry Access is one aspect of the complex China equation. Building in China creates jobs and upgrades skills. That goes down well in Beijing, which sees aerospace - the business of designing and manufacturing aircraft - as a strategic industry, with China's air transport market second only to the US market by 2020. "We believe that the local manufacture of the ERJ145 family aircraft provides Embraer with a competitive edge by providing a well-proven product and by being closer to the customers. According to Embraer's forecast, there will be some 200 aircraft within the 30-to-60 seat category delivered to Chinese airlines in the next 20 years," says Guan. Orders, sluggish so far, in part due to aviation reform pausing this year, will surely come though, for were these ventures to fail some investors in aerospace and other industries might lose heart, causing headaches for the government, which needs foreign investment to create sorely needed jobs and introduce new technology. Short-term, local production avoids import duties of 24% on small regional jets. However, these are being cut by World Trade Organization (WTO) agreements come 2006. "These taxes are being reduced, and WTO promises to reduce them further still. Unlike Russia, for example, China is an export-driven economy and must carefully adhere to its WTO promises," says Richard Aboulafia, Teal Group's senior airlines analyst. Manufacturing's migration from West to East will not happen without much kicking and screaming. Tens of thousands of Western jobs will be lost. While that may concern shareholders, ultimately they want greater returns, which moving to China promises. It is a delicate subject manufacturers, judging by Airbus, Boeing and Bombardier declining to comment despite repeated requests, would rather avoid. Down on the shop floor finding a suitable collaborator, politically and technically, in the right place needs careful homework. "The main challenge for the implementation of local manufacturing activity is the selection of the right partner," says Guan, Embraer China's managing director. "Location and infrastructure are other important considerations, especially in light of this summer's power shortage," says Devagunam. Government involvement a plus - or minus Government involvement, although gradually shifting to a more hands-off Western approach, remains significant. "There is still a great deal of government intervention at all levels, which can be supportive, but can also hurt if you are on the wrong team," says Peter Harbison, managing director of the Center for Asia-Pacific Aviation. If all this were not enough, there is another ball in the air for aerospace bosses to juggle: quality. Improving it is driven in no small measure by China's fast-growing airliner maintenance, repair and overhaul (MRO) industry, which has seen significant foreign investment and is winning ever-larger shares of business on cost, quality and turn-around times. "Quality control is an issue, but it's not as big an issue as it was," says Devagunam. "If you look at other manufacturing, such as autos, it has improved. But there's a long way to go." Ensuring quality can weigh heavily when it comes to foreign companies producing aircraft in China. "It is, in fact, not always a good economic move to offshore some of that production because quality control can be very expensive. However, progressively these problems will diminish," Harbison says. Balancing these sometimes fiendish challenges are low wages. Just how much can be saved on labor is hard to ascertain, but with salaries accounting for 20-40% of an aircraft's cost, it is not insignificant. Given that aircraft, unlike cars, are still largely hand-built, labor costs will remain an important consideration for years to come. China's fast growing maintenance, repair and overhaul business, along with increasing amounts of high-tech equipment such as mobile phones, computer chips and medical products, all attest to China's manufacturing advantages. "Competitive pricing will pressure manufacturers to move parts production to China. Given China's large skilled workforce, it will be a long time before wage inflation takes hold. This pressure will also force wages down in the West," says Richard Aboulafia, an analyst with The Teal Group in Fairfax, Virginia. Straight Aero announces its free commercial aviation parts search tools. StraightAero was born out of the commercial aerospace parts business. The tools that parts resellers, OEMs, and repair stations have not been avaialble through easily accessible and economical means. StraightAero is here to assist with those needs. We offer several free services such as manufacturer reference and company directory searchs as well as a free community forum to have questions answered around part modification, sales, assistance with part requests, service techniques and general community. These types of tools are available commercially by other companys such as the World Aviation Directory and AvRef but they are unaffordable to the small to mid market company's that are the foundation to the aviation industry. One of the biggest challenges the aerospace industry has to over come is the public perception that the sommercial aerospace industry is environmentally unfriendly. Boeing released the Dreamliner which was boasted to be the 'greenest' commercial airliner. Now we have the release of the ECOJET. The budget short haul carrier EasyJet recently unvieled its Ecojet airline model which helped give the aerospace industry a vision of the future. The most obvious difference between the Ecojet concept and a today's standard airframe designs is the tail section of the airliner. The aft section of the craft houses two large propfan engines. These rear mounted open rotor engines provide unrivaled environmental performance for short haul travel. This comes in the maintenance of these engines which are mounted unter the wing throughfore the rear mounted engine is the best solution. This unusually designed aircraft was based on designs that Airbus and Boeing had already under consideration. CFM International and Pratt and Whitney which are powerplant manufacturers admit that they are evaluating open roter engine design alongside traditional geared turbodfans. The manufacturers both feel that the introduction of traditional geared technology into a open rotor design is possible but aren't positive when it would be available. Andy Harrison, CEO of EasyJet, notes that the aerospace technology is available to develop the EcoJet which would be 25% quieter and emit 50% less carbon dioxide. This could be another great step to providing a 'greener' airline for the aerospace industry.